Having the full range of digestive enzymes working correctly is essential to healthy digestion and ensures the optimal absorption of nutrients from your food. 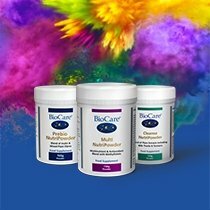 At BioCare, we produce a variety of supplements – all suitable for vegetarians and vegans – that allow you to choose either a broad spectrum of digestive enzymes, or to support the digestion of specific food groups such as dairy, fat or gluten. 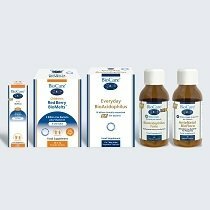 Browse our range of digestive enzyme supplements below, or find out more about their use in the body. Digestion is a complex process that starts in the mouth and continues all the way through the 9 metre long digestive tract. As food travels through your digestive system, different enzymes break down specific food types. For example, bromelain helps turn protein into amino acids, lipase supports the conversion of fat into fatty acids and cholesterol, and amylase is used in transforming carbohydrates into simple sugars. If your body falters in producing any of these enzymes, the corresponding nutrients may not be absorbed so efficiently. 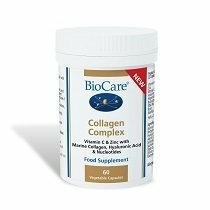 At BioCare we offer a wide range of digestive enzyme supplements. Enzyme complexes such as Spectrumzyme provide the full range of enzymes covering all food groups, while Lactase Enzyme, Carbozyme, Lipozyme and Glutenzyme focus on the digestion of specific food groups - dairy, carbohydrate, fats and gluten respectively. Stomach acid is designed to break down substances that enter the stomach, so when we developed our enzyme supplements, ensuring stability was a key priority. All our products are sensitive to the pH level of your stomach acid, and are expertly formulated to remain stable throughout. We also produce a number of digestive enzymes supplements with added live bacteria to give your digestive health even greater support, including Polyzyme Forte, Bioenzyme and Prolactazyme Plus. For more information about digestive health and a wider range of digestive health supplements – including live bacteria, plant-based supplements and supportive antioxidants – explore our Advice section, or browse our full range of enzyme supplements below.